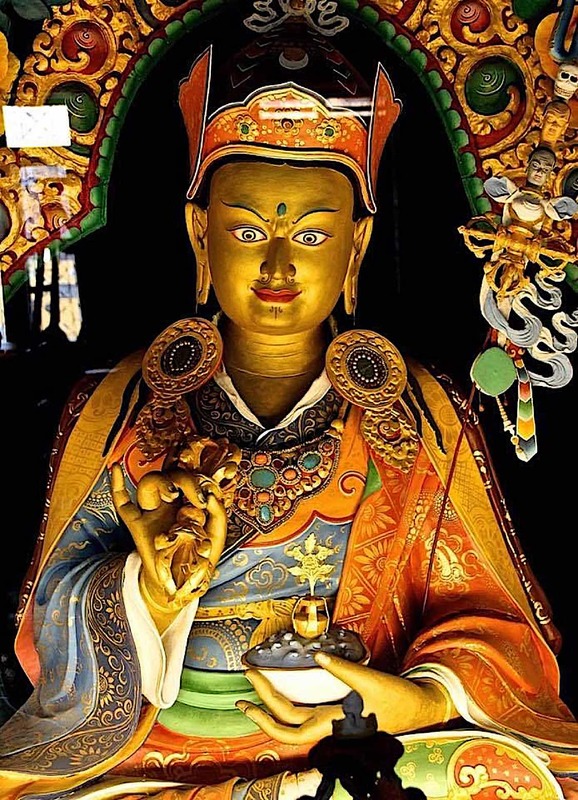 Guru Rinpoche, the Lotus Born, the precious master. Although this teaching is a concise teaching focused on “the time of death” and therefore clearly for advanced students — particularly with its focus on the true nature of reality, of emptiness, of the disolution and death process and completion — the teaching itself is resoundingly inspirational. 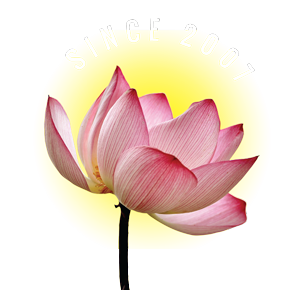 We can imagine Lady Tosgyal, about to be separated from her beloved teacher — having been with her master since the age of eight — having doubts, and then, the serene Guru emphasizing the essence of practice. This oral teaching, and the Lady’s hearfelt plea, resonates with both beginning and senior Tibetan Buddhist students: if the great Lady can have doubts — despite years of accomplishments — then we need not feel embarrrassed to ask questions of our teachers at all stages of our learning. We need not feel bad about going back to our notes and videos of past retreats; we should not worry if our question seems too basic. 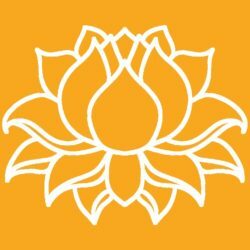 The Lotus Born, kindly instructing even the most accomplished Lady in the basics, is an example for us all. In Tibetan Buddhism, teachers always invite questions. Although every teaching of Padmasambhava, the second Buddha, the Lotus Born is precious, this concise teaching is a wonderful “refresher” for all devoted practitioners. 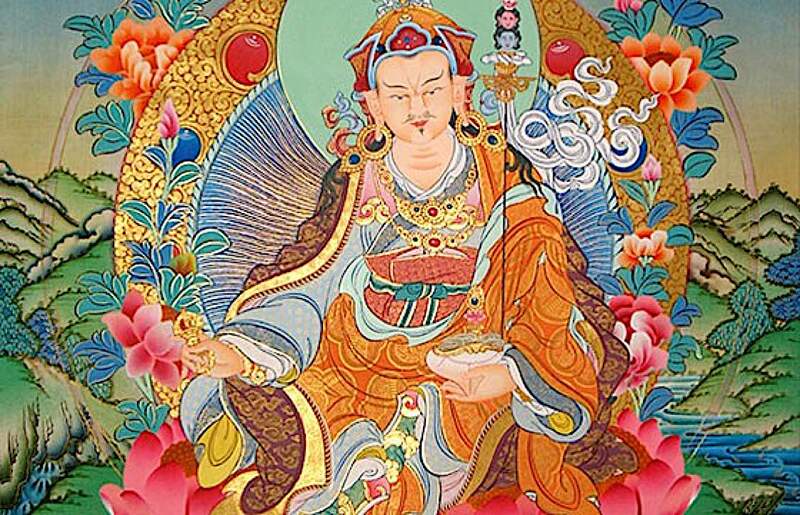 Padmasambhava, the Lotus Born Guru Rinpoche. “Devoted one with a faithful and virtuous mind, listen to me. Although there are many profound key points of body, rest free and relaxed as you feel comfortable. Everything is included in simply that. Although there are many key points of speech such as breath control and mantra recitation, stop speaking and rest like a mute. Everything is included in simply that. Although there are many key points of mind such as concentrating, relaxing, projecting, dissolving, and focusing inward, everything is included in simply letting it rest in its natural state, free and easy, without fabrication. The mind doesn’t remain quietly in that state. If one wonders, Is it nothing?, like haze in the heat of the sun, it still shimmers and flashes forth. But if one wonders, Is it something? it has no color or shape to identify it but is utterly empty and completely awake—that is the nature of your mind. Having recognized it as such, to become certain about it, that is the view. To remain undistracted in the state of stillness, without fabrication or fixation, that is the meditation. In that state, to be free from clinging or attachment, accepting or rejecting, hope or fear, toward any of the experiences of the six senses, that is the action. Whatever doubt or hesitation occurs, supplicate your master. Don’t remain in places of ordinary people; practice in seclusion. Give up your clinging to whatever you are most attached to as well as to whomever you have the strongest bond with in this life, and practice. Like that, although your body remains in human form, your mind is equal to the buddhas’. At the time of dying, you should practice as follows. By earth dissolving in water, the body becomes heavy and cannot support itself. By water dissolving in fire, the mouth and nose dry up. By fire dissolving in wind, body heat disappears. By wind dissolving in consciousness, one cannot but exhale with a rattle and inhale with a gasp. At that time, the feelings of being pressed down by a huge mountain, being trapped within darkness, or being dropped into the expanse of space occur. All these experiences are accompanied by thunderous and ringing sounds. The whole sky will be vividly bright like an unfurled brocade. Moreover, the natural forms of your mind, the peaceful, wrathful, semiwrathful deities, and the ones with various heads fill the sky, within a dome of rainbow lights. Brandishing weapons, they will utter “Beat! beat!” “Kill! kill!” “Hung! Hung!” “Phat! phat!” and other fierce sounds. In addition, there will be light like a hundred thousand suns shining at once. At this time, your innate deity will remind you of awareness, saying, Don’t be distracted! Don’t be distracted! Your innate demon will disturb all your experiences, make them collapse, and utter sharp and fierce sounds and confuse you. Guru Rinpoche, the precious Lotus Born. All experiences of rainbow lights are the natural manifestations of your mind. All the peaceful and wrathful forms are the natural forms of your mind. All sounds are your own sounds. All lights are your own lights. Have no doubt about that. If you do feel doubt, you will be thrown into samsara. Having resolved this to be self-display, if you rest wide awake in luminous emptiness, then simply in that you will attain the three kayas and become enlightened. Even if you are cast into samsara, you won’t go there. The innate deity is your present taking hold of your mind with undistracted mindfulness. From this moment, it is very important to be without any hope and fear, clinging and fixation, toward the objects of your six sense faculties as well as toward fascination, happiness, and sorrow. From now on, if you attain stability, you will be able to assume your natural state in the bardo and become enlightened. Therefore, the most vital point is to sustain your practice undistractedly from this very moment. The innate demon is your present tendency for ignorance, your doubt and hesitation. At that time, whatever fearful phenomena appear such as sounds, colors, and lights, don’t be fascinated, don’t doubt, and don’t be afraid. If you fall into doubt for even a moment, you will wander in samsara, so gain complete stability. At this point, the womb entrances appear as celestial palaces. Don’t be attracted to them. Be certain of that! Be free from hope and fear! I swear there is no doubt that you will then become enlightened without taking further rebirths. At that time, it is not that one is helped by a buddha. Your own awareness is primordially enlightened. It is not that one is harmed by the hells. Fixation being naturally purified, fear of samsara and hope for nirvana are cut from the root. Becoming enlightened can be compared to water cleared of sediments, gold cleansed of impurities, or the sky cleared of clouds. Having attained spacelike dharmakaya for the benefit of oneself, you will accomplish the benefit of sentient beings as far as space pervades. Having attained sambhogakaya and nirmanakaya for the welfare of others, you will benefit sentient beings as far as your mind pervades phenomena. If this instruction is given three times to even a great sinner such as one who has killed his own father and mother, he will not fall into samsara even if thrown there. There is no doubt about becoming enlightened. 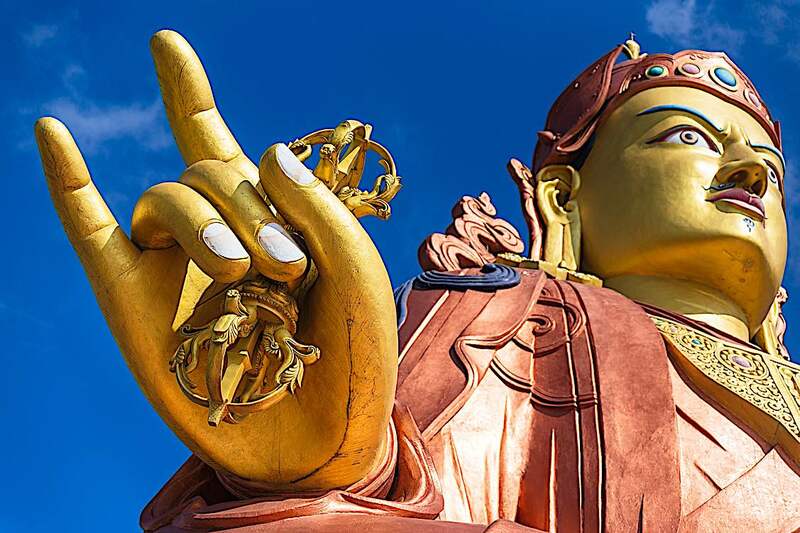 Padmasambhava giant statue at Guru Rinpoche temple. Even if you have many other profound teachings, without an instruction like this, you remain far away. Since you don’t know where you may wander next, practice this with perseverance. 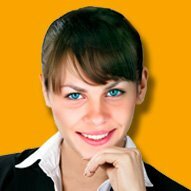 You should give this oral instruction to recipients who have great faith, strong diligence, and are intelligent, who always remember their teacher, who have confidence in the oral instructions, who exert themselves in the practice, who are stable-minded and able to give up concerns for this world. Give them this with the master’s seal of entrustment, the yidam’s seal of secrecy, and the dakini’s seal of entrustment. Although I, Padmakara, have followed many masters for three thousand six hundred years, have requested instructions, received teachings, studied and taught, meditated and practiced, I have not found any teaching more profound than this. 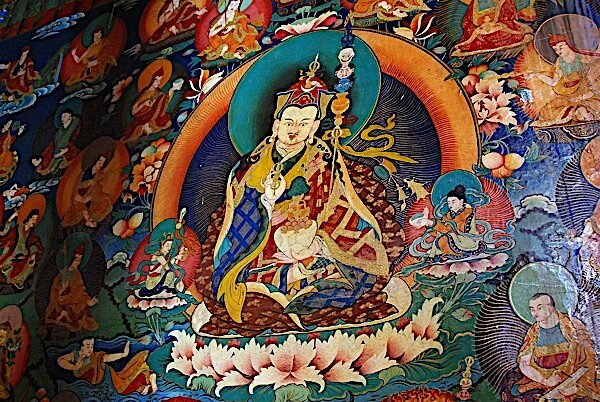 Padmasambhava Guru Rinpoche sacred image on the wall of Rongbuk Monastery. 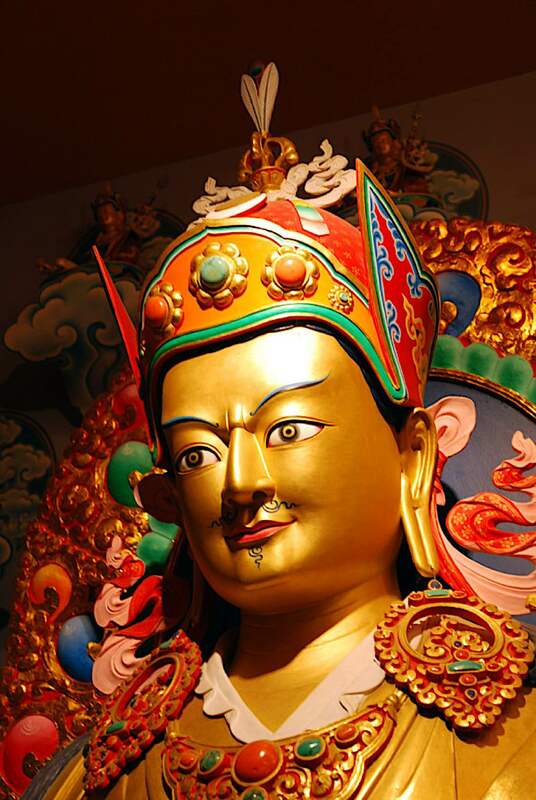 Having spoken, Guru Rinpoche mounted the rays of the sun and departed for the land of the rakshas. Following that, Lady Tsogyal attained liberation. She committed this teaching to writing and concealed it as a profound treasure. She made this aspiration: In the future, may it be given to Guru Dorje Lingpa. May it then benefit many beings. This completes the Sacred Refined Essence Instruction, the reply to questions on self-liberation at the moment of death and in the bardo. From Dakini Teachings by Padmasambhava Guru Rinpoche. (p. 153). Rangjung Yeshe Publications. Kindle Edition. May all beings have happiness and its causes! 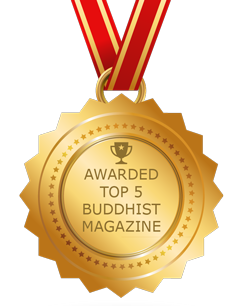 Wishing you a healthy and peaceful Holiday and New Year from Buddha Weekly.